1. Wash and pat dry 4 eating apples and remove stalks. Carefully push a lolly stick into each apple. 2. Melt 200g of Scotbloc Milk Chocolate Flavour Covering according to pack instructions and place in a small bowl. Dip each apple in the chocolate, spooning over to thinly cover each apple as much as possible. Rest each apple in a tall tumbler to set. 3. 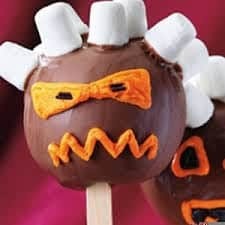 Push White Mini Marshmallows into chocolate on top of apples, just before it sets, to make white spiked hair. 4. Once chocolate has set, decorate with Designer Icing to make scary faces.